You can keep an account for free if you'd like, but if you're no longer needing it you can remove it from your dashboard. One thing to keep in mind before you officially delete an account, is that you can keep using it for free as long as you like, and we'll keep pulling your stats for you! This way you can always come back in the future and check your progress. Deleting one account will not effect any other accounts you might have. Go to Account Settings (located in the settings menu in top right hand navigation). 2. 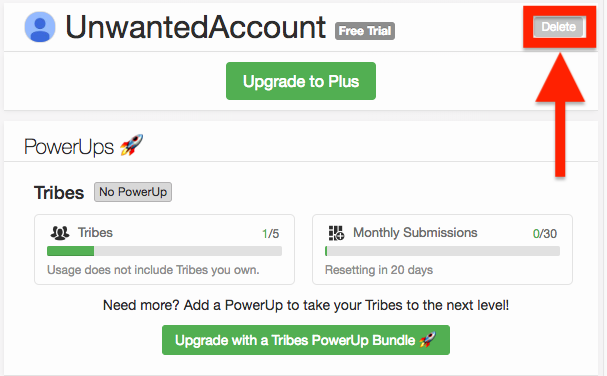 Click the Account you want to remove from your Tailwind dashboard. 3. Click "Delete" at the top right of the account's information box. 4. "Are you sure you want to delete this account? All of your data and history will be lost" Click the "OK" button to confirm.